As stated in the condition field this is an "As-Is" item for sale. This one looks in very nice condition for its age. LENS is clean & clear (no scratches). That is the extent of my knowledge on this item. This a Leitz Leica Lens Case with 3 Mid 1940s Leitz Leica Lenses and Accessories. Leitz Leica Lens Case with 3 Leica Lenses and Accessories. Leitz Leica Elmar 35mm, f/3.5 lens SN605399 (mfg 1946) Screw Mount. Leitz Wetzlar leather camera case with strap R-3/4? It is a original brown leather Leitz Westlar everready case with a neck strap I think it may be for a Leitz/Leica R-3 SL and R-4 SL. the inside of the case measures approx 6" across if you need any other measurements please write. the outside of the case is in very good condition. the inside of the case shows some minor wear from a camera being stored in it. Ideal for protecting your camera, for display or for a collection. Buyer pays all shipping and handling costs. 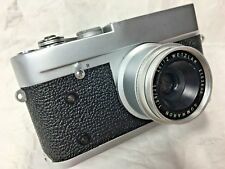 Ernst Leitz Wetzlar Lens Elmar f=9cm 1:4 Serial No. 372948 w/ case. -E. Leitz Wetzlar Germany Synchronbutzer Folding Flash w/ original box and bulb. Serial Nr 1141939. Leitz Summaron 2.8/35mm lens. Also the film spool is included. The body is in excellent working condition. The fix shutter speed works great, and also the film transport working properly. SN 1130983. Case is functional, shows wear and scratches to outside due to normal age and use. I am not an expert and have described this item to the best of my ability. No dings or deep scratches, just GREAT. The body is in good working condition. All shutter speeds seem accurate (never had problem with exposure), and the slow one works without delay. Film transport working properly also. The smaller cap in the front will fit Leica lenses with E-36 front, and the other two will fit lenses with E39 front, such as most of the M-lenses. Clean condition, with signs of moderate use. 2001 Leica "O" Series Limited Edition Replica is a faithful reproduction of the 30 original 1923 prototypes. Beautifully engineered. Complete with boxes and papers and instruction manual, and leather case. Printed in Germany (printed in four languages, including English). From Local Estate. Leitz Wetzlar Zoom Leicina 8SV. S/N: 8SV 36112 Made in Germany. Lens: ANGENIEUX Zoom Lens ( f1.8 7.5 - 35 mm ). 4 x AA batteries ( for film drive ): I have tested with the batteries but couldn't see the result. LEICA - GENERAL CATALOGUE. - Rare & original LEICA General Catalogue, 4th Edition. - Original from the year 1939. 4th Edition. - Excellent condition for an almost 80 years old catalogue. Cover with traces of use. Viewfinder looks good, rubber eye piece is stiff. Focus is smooth and accurate and the rangefinder clear. supplied with film spool and lens cap. The item you see is the item supplied. It has no affect on image results whatsoever. You should expect everything to functionreasonably well, and that optics have no problems that would noticeably affect image quality and results, unless we describe them otherwise. Leitz Wetzlar Visoflex Prism. THe prism is in very good condition for it's age. Serial number is 333788. Overall condition is good for its age. The body has no dents,, no repairs, everything works. Could use a good cleaning. not tested with the film. SUMMICRON 50MM F2 MADE IN CANADA. LEICA R3 MADE IN GERMANY. This is the R3 that was made in Germany. LEICA CASE. LEICA STRAP. Country/Region of Manufacture Germany. THIS IS A USED ITEM. This brochure was given (in very small numbers) to Leica Leicaflex dealers in the 1970s, but now we don't think you'll find another copy anywhere. and if we were to list everything about the amazing leitz, Leica and Leicaflex product range, we could go on for pages, but this brochure does it for us. For the sale Leica copy lens Sonnar 5cm/1.5 for M39.Lens in good working condition.Glass clean & clear. YOU NEED MORE THAN JUST THIS to make copies - but it is what would be "The Eldia Printer". Both spools present. See photo(s) - this is the item you will get. Roll Film Copy Printer. For the sale LEICA COPY LENS Wide angle Orion 15 28mm/6 M39 SM in good working condition.Glass clean & clear. For the sale Leica lensRare Prototype Leica ELMARIT-C 40mm f/2.8 lens for Leica CL only 500 was made. Elmar 13.5cm/4.5 for large format cameras. This item has the markings that reads E.Leitz Wetzlar. This item is untested but only shows minor wear. Overall condition is Very Good to Excellent and nice accessory to add to one Leitz collection. Moderate signs of age and use, internal with dust, sold between 1928-1931, oldest version ! The best impression gives always the pictures. It is not possible to test them all. Small signs of use are normal. Condition: used. technical condition. The best impression gives always the pictures. It is not possible to test them all. Small signs of use are normal. On the lens mark ernst leitz wetzlar summitar f = 5 cm 1 : 2 No 658898. #02060 on bottom of hotshoe. In original boxes. One has NOOKY on box and the other has catalog number 67200 on box. Both are in excellent condition. One owner.I am second owner. C abinet kept and well maintained. Used for professional use only.